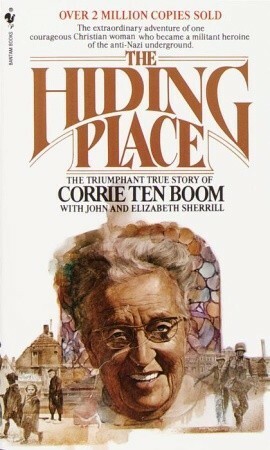 Corrie ten Boom and her family were Christians who were active in social work in their home town of Haarlem, the Netherlands. During the Nazi occupation, they chose to act out their faith through peaceful resistance to the Nazis by active participation in the Dutch underground. They were hiding, feeding and transporting Jews and underground members hunted by the Gestapo out of the country. It is estimated they were able to save the lives of 800 Jews, in addition to protecting underground workers. On Feb. 28, 1944, they were betrayed and Corrie and several relatives were arrested. The four Jews and two underground workers in the house at the time of the arrest were not located by the Nazis and were extricated by the underground 47 hours after they fled to the tiny hiding place (located in Corrie's room). The ten Boom family members were separated and transferred to concentration camps. Corrie was allowed to stay with her precious sister, Betsy. Corrie's father (Casper), her sister (Betsy) and one grandchild (Kik) perished. Corrie was released in December of 1944. These acts of heroism and sacrifice became the foundation for Corrie ten Boom's global writing and speaking career which began after she was released. Ten Boom has received numerous awards for her writing and speaking. Notably, she was honored by the State of Israel for her work in aid of the Jewish people by being invited to plant a tree in the famous Avenue of the Righteous Gentiles, at the Yad Vashem Holocaust Museum, near Jerusalem. She was also knighted by the Queen of the Netherlands in recognition of her work during the war, and a museum in the Dutch city of Haarlem is dedicated to her and her family.